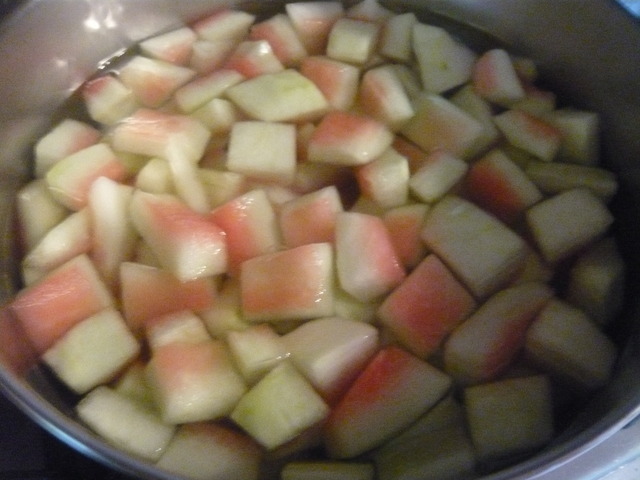 Watermelon rind pickles are an old fashioned thing to make. Because they are made from the part that is normally thrown out, they seem almost “free”. I’ll give my exact weights then give the recipe per kilo of rind. After the green peel and pink watermelon is removed from a 12 # watermelon there remains about 4 # (1874 g) of rind. Cut this into one inch cubes and soak it in an equal weight of 7.5 % salt brine for three hours. This seasons the rind but also firms it by reducing some of the moisture. After draining, rinsing and drying overnight in the fridge the weight of rind had dropped 1605 g. The rind was then boiled with an equal weight of clean water (2 qts.) for three minutes to adjust the salt and after draining the rind weight had dropped to 1503 g and the rind was barely translucent. 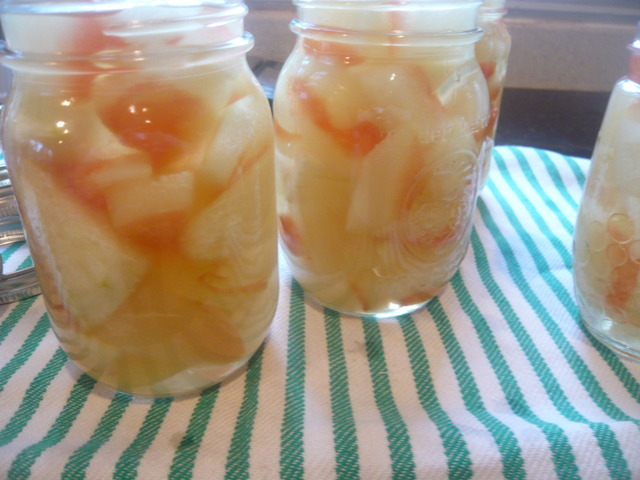 The jars are prepared and a pickling liquid is made from white vinegar 688 g (3 cups), water 256 g (1 cup), sugar 600 g (3 cups). The recipe I had suggested flavoring the pickling liquid with 3 cinnamon sticks and 1 t cloves but I used instead sliced fresh ginger root 16 g (about a thumbs worth) and cardamom seed 7.3 g (2 t). I tied these up in a tea bag (cheese cloth would work as well). The spices are brought to the boil then allowed to steep for 15 minutes covered. 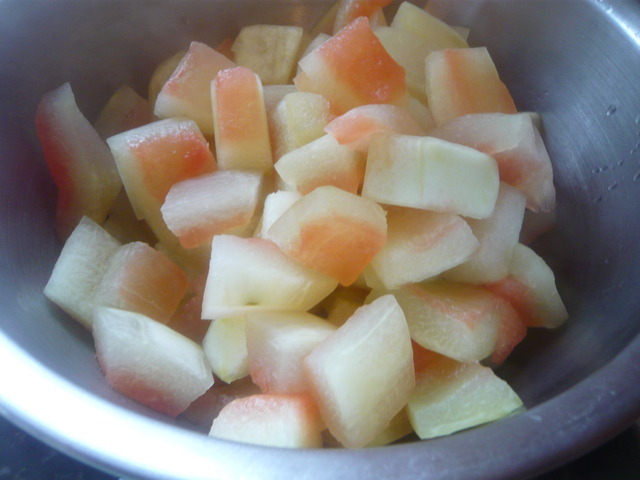 The rind is then added and the mixture is boiled for 3 minutes. The pickles are then put in jars, sealed and processed in boiling water for ten minutes (longer at higher elevations). Four pints. that looks great! this is something that i was just talking to a friend about a few days ago. I like the idea, especially as they are made with an ingredient that is normally discarded - how are they eaten? As an accompaniment to cheese, tossed into a Caesar-style salad? I like them with cheese and crackers (biscuits) in the evening. I may have to consider adding them to a salad, thanks. Whats the taste and texture like ? Is it similar to a gherkin or is it sweeter ? If you had a choice between any pickle would you still choose this ? They have a sweet - sour taste and the spices are already in the background. I should have been more thorough in removing the inner part of the rind. They have some crunch but less than a well made cucumber pickle. They go nicely with cheese but if I had my choice I would pick the bread and butter pickles I made earlier this Spring. I am glad to be able to say that I made them. The only watermelon rind pickle I've heard of is in the book 'Preserves' by Lindy Wildsmith, and it's interesting to see how different it is to this method. Possibly because it's 'Williamsburg sweet watermelon rind pickle'. Skin left on but cut into much smaller pieces, soaked in dilute vinegar, simmered and jarred in spiced sugar syrup. The picture in the book looks appetising, almost like candied peel, but I haven't tried it as is because I'm not all that fond of any type of melon! I attempted it with pumpkin rind* a while ago, and while I can't say it's not an acquired taste (very crunchy too) it's not altogether bad. But like I say, I'm interested in this version too. I'll have to echo some of Snags' questions from last year. I don't like fresh cucumber either, but somehow I'm fond of an occasional pickled gherkin: is there a similar kind of difference or change in flavour with this recipe? 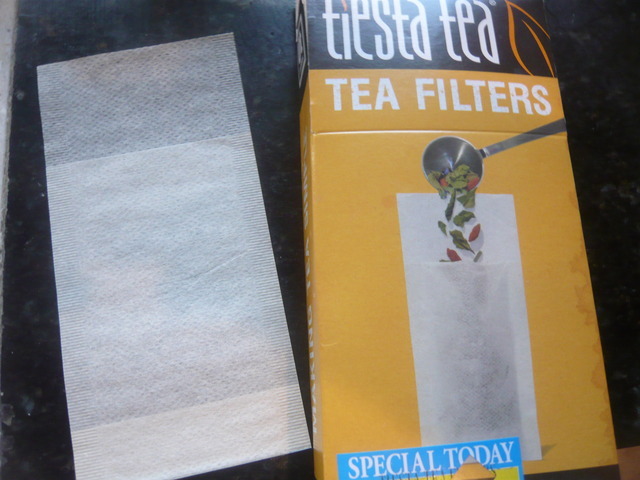 I need to look around for those tea filters, too! * Can't resist the glut of pumpkins in the shops every October, since Hallowe'en took on a more American flavour round here, especially when they go for pennies on the 31st. Lindy's book has a pretty good pumpkin chutney recipe too.